Legendary: The “Drum Engine” drum machine is back. 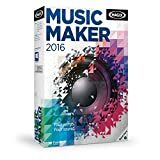 This entry was posted in Software and tagged 2016, Beginners, both, MAGIX, Maker, Music, professionals, program by Computer Education World. Bookmark the permalink.